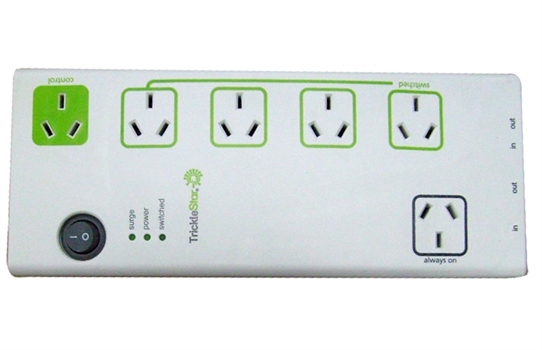 The TrickleStar ADVANCED POWERSTRIP (APS) provides high quality surge protection & reduces standby power consumption of PC & TV peripherals. The TrickleStar APS has inbuilt current sensing circuitry with 2 different switching thresholds to sense when a Control Device (typically a TV or PC) is On or Off/Standby and to then switch On/Off the relevant power Outlet/s. The APS is easy to install, provides simple automation to reduce wasteful standby energy consumption and is suitable for both residential & workplace applications. dissipating heat faster than traditional MOV’s. More importantly the ceramic casing is fireproof and is capable of preventing fire during abnormal surge conditions. Up to 48dB noise filtering. 6 foot incoming power cable with angled space saver plug.